This thread will show a sample of my 3D portfolio. Pretty impressive collection of work there, good job. I am indeed impressed. I'm suprised I haven't seen some of your work in UT3 or UT2004 with the work you do I would have expected to have seen some superior character designs. especially with the steampunk type eva-looking characters you have on the sample sheet. Very cool looking indeed. Amazing texture work! Great job! since this is the coolest stuff i have seen in a long time, do you mind a mini interview? 1-HEY, DO YOU WORK FOR A GAME COMPANY? 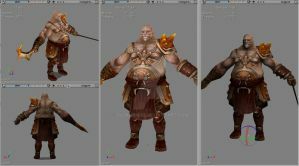 2-do you model, texture and rig all these yourself? 3-do you only use color maps? 5-what program do you use? 6-do you offer any tutorials? 7-how long have you been modeling? 8-can you offer any tips? 5 - Maya 2008 and 3dsmax7.0 for 3D. and Photoshop CS for painting. 8 - Just check my tutorial, time is always crazy, no time to do anything like that this year... I hope it for coming year! Thanks for all the FAV and the comments! The details are so amazing especially the monster models. How long does it take you to model and to texture a single character? If you put my character in a final fantasy engine, it's gonna be ok because they don't use normal mal stuff and all this light effect . I'll probably update my website in coming month with some normalmaped stuff. you are not very bad at all ..
RPGSI Studio / LDVEditions Prod Admin. SOulsSHine - Open SOurce Comercial RPGSI Production Online. Totally impressed! The mossy characters remind me a lot of something one might see in shadow of the colossus. Tiens, toi ici ! Désolé, c'est pas moi qui vais pouvoir t'aider... Je serai tenté de te dire, de la pin'up, de la pin'up ! Mais bon, je ne pense pas que ce soit le genre de réflexion que tu attendes. EricMor > don't worry about his game developer carrier, he's already working on professional games and some amateurish ones. Moi j'adoooore ton staïle !Pourquoi tu veux en changer ? You'll find examples my of 3D gamestudio work too. 3D gamestudio is useful for it's vertice animation acceptance, but only go for torque after you created some backgrounds and snapshots for easy programmer recruiting, since the app needs lots of programmers to work well. By the way, already inserted mouth an expression on the anime characters? That's important too. don't worry about his game developer carrier, he's already working on professional games and some amateurish ones. i like your cartoony style because with that specific style you can step beyond the boundaries of reality and get away with it and do things that would not look as good on a realistic looking character. your stuff is still awesome! i am looking through them again and i think "omg cool"